You’ve done it! You’ve written a children’s book, or maybe a young adult. Congratulations. But before you start to pitch or query your finished manuscript, you need to know where it fits in the panorama of kidlit. Is your middle-grade novel about the same length as the comparison title (comp) you have in mind? Is the reading level of your chapter book in the same range as some popular series? 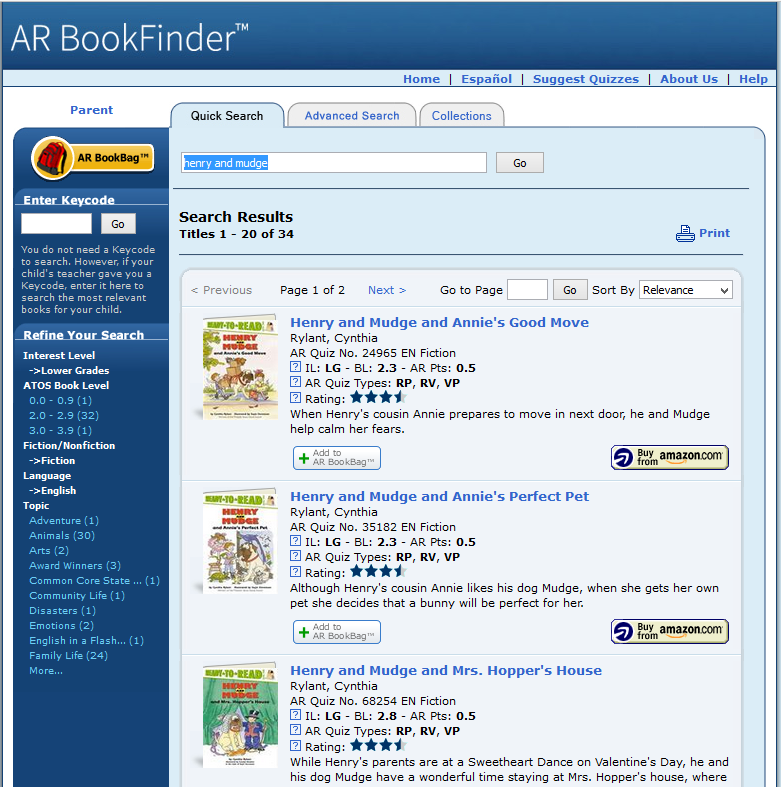 The AR BookFinderTM helps take the guesswork out of researching kidlit. It’s designed for teachers and parents, but as a writer, you can use it to research books that may—or may not—be similar to your works-in-progress. Renaissance Learning provides technology-based teacher resources for differentiated instruction (aka personalized learning). Their flagship literacy offering, Accelerated Reader 360, is an online system that matches students with books at a “just right” level for independent reading. 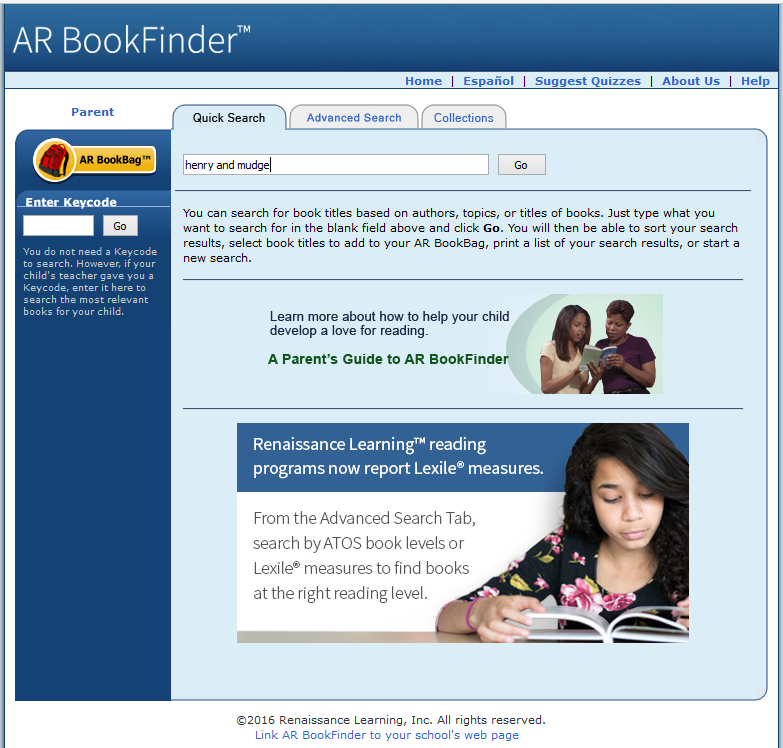 Kidlit writers are most interested in the AR BookFinder, a database of thousands of books for children and teens, both fiction and nonfiction, with a wealth of information about reading level, page count, word count, and even publication history. 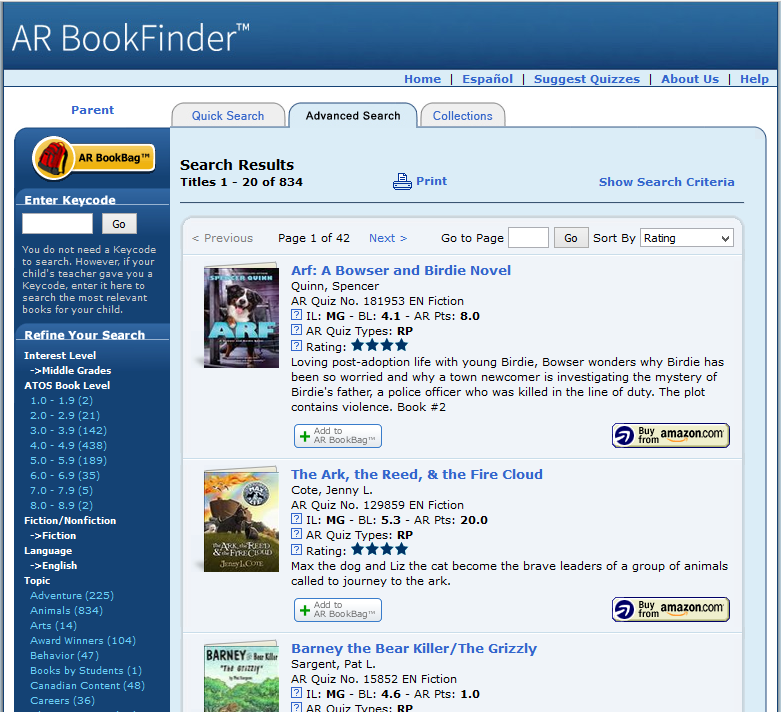 (1) Go to the AR BookFinder home page. A screen shot of the Quick Search tab is shown. Once there, type “Henry and Mudge” into the search box and click “GO.” You may also search by author or title. 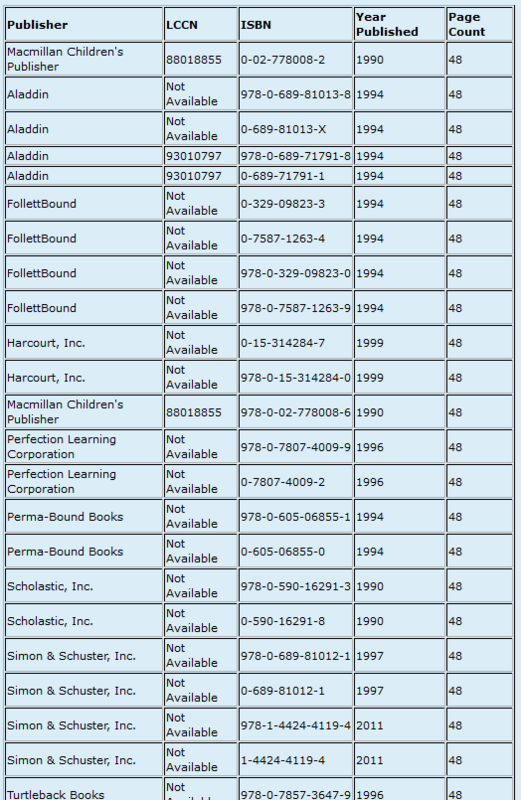 (2) Your search returns a list of “Henry and Mudge” books. There are 34 books in the series. (3) Clicking the title of a specific book pulls up more details. Some details, like rating, word count, and topic, are self-explanatory. Others are specific to the AR system. Henry and Mudge and the Happy Cat has a word count of 904. Hmm. Your 30,000-word story about a boy and his dog is definitely for readers older than the Henry and Mudge crowd. Don’t be discouraged that you guessed wrong—this is really important information, and you learned it before you queried the wrong agent or publisher. AR Quiz Availability: A list of classroom quizzes available for this book. Not much use for researching comps. ATOS Book Level: Reading level, based on the ATOS Readability Formula, and given as a grade plus a fraction of a grade. Henry and Mudge and the Happy Cat has a level of 2.7–past the halfway point for the Grade 2 year. Interest Level: For example, Lower Grades, Middle Grades, Middle Grades Plus, and Upper Grades. This set of categories is specific to the AR realm, but it’s of interest to writers. A book can have a low Book Level but a high Interest Level, if it’s intended for older children who still struggle with reading. AR Points: An AR Quiz score that rates books based on difficulty and length; Not much use to writers. Scrolling down the page, you find a summary of the book’s publication history. It’s worth noting that this book was first published in 1990; the later pub dates show that the book has many later editions, but it’s still the same book. When you’re doing research for a new manuscript, it’s useful to look at classics like Henry and Mudge, but it’s absolutely necessary to research titles that have been published recently—say, the last 3 to 5 years. 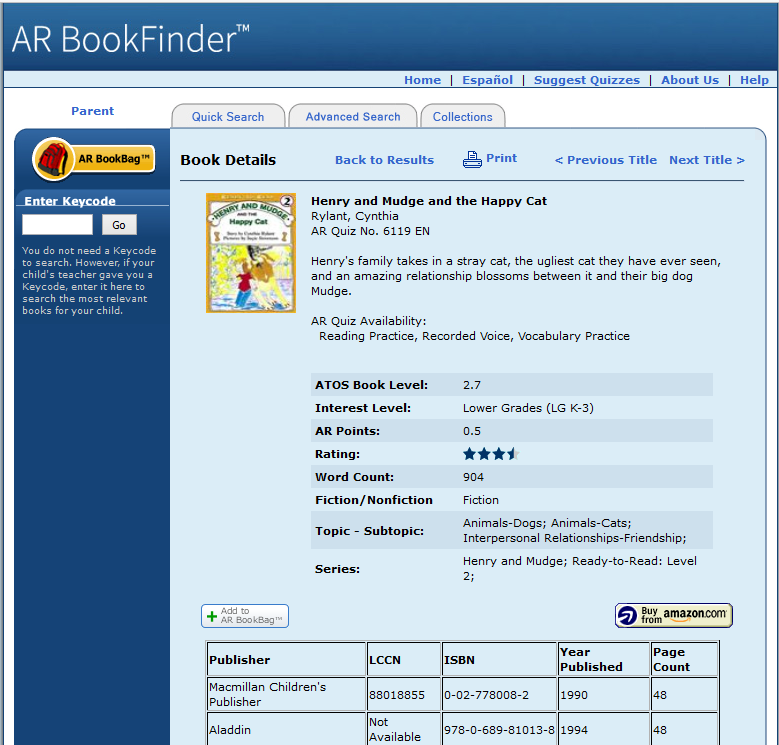 Unfortunately AR BookFinder does not let you search by publication date. The “Advanced Search” tab allows you to search by Topic, Interest Level, ATOS Book Level, Fiction/Nonfiction, and a couple of other parameters. YIKES! 834 middle-grade books about dogs? If you are writing nonfiction about a very specific topic and want to find other books on the same subject, Advanced Search may be useful. But if you are trying to figure out how your fiction book fits into the kidlit landscape, you may be better off browsing the children’s section of your local brick-and-mortar library or bookstore, and then coming back to the AR BookFinder for stats on specific titles. Is your research finished? Hardly! But you have a better idea of where your book fits into the spectrum of children’s books currently available—or how you may need to revise it, to make it a good fit for your intended readership. What tools do you use to for kidlit research? 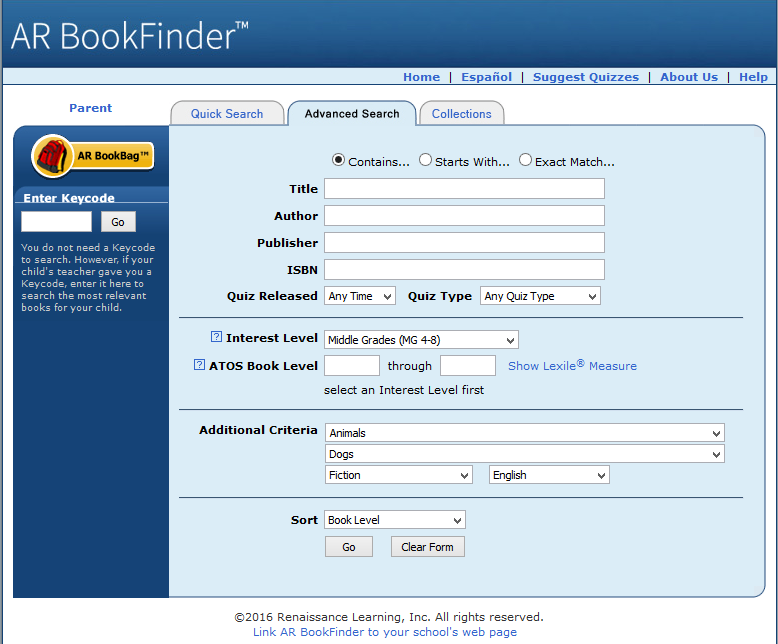 Have you used ARBookFinder as a teacher or parent? Share your experiences and questions in the comments section. NOTE: This is an update of a post that first appeared in November, 2013, about the AR Quiz Store. AR has since revamped its online tools. As always, Marianne, you have given us information that will be valuable to us as writers. I can’t wait to explore the site! Thank you. Hi Jackie, Thanks so much for nominating me! You’re so sweet! I’ve been offline and/or getting used to Windows 8 the past couple of days (old computer, new computer) and am catching up now. You explained the award really well but I still have a couple of questions; is there a way to email you? Thanks! This looks like a terrific resource. Thanks for opening my eyes to it, Marianne! Wow Marianne! I’ve never heard of the AR, so this is great! Thank you for a great introduction. You may choose to display more than ten titles at a time. You may search by award and there is a list of all the awards to choose from. This resource is amazing. I have been using it for years since I have been teaching for years. You can get so lost in this because there are literally so many titles, genres, and state recommendations. This is awesome. Jackie, thanks so much for chiming in. Since you’re a teacher, I’m curious–what resources are provided, in addition to comprehension quizzes? I will be blogging about that tomorrow on A cure for the common core. It is hard right now because big businesses are jumping on the common core bandwagon. So states are buying all these new programs, forcing teachers to implement, but before they can assess the reliability and validity factor, something new replaced it. But I found websites such as roythezebra.com, bookadventure.com, and discoveryeducation.com, and if the child does not have a library book, then this is my favorite – wegivebooks.org. The children can read books online. Everyday, I read Llama,Llama. I love that book. I’ve used AR for finding word counts of comp titles, but I really haven’t spent time exploring the quizzes- this is a FANTASTIC resource!! Thanks for this! Thanks, Jen. Mostly the post is about finding word counts and reading levels. You can’t actually access the quizzes unless you have a membership.